The Godfather's Blog: COMMENTARY: Another Dominant Win For NASCAR's "Big Three"
COMMENTARY: Another Dominant Win For NASCAR's "Big Three"
In NASCAR these days, the rich just seem to get richer. 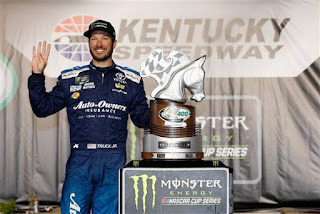 Martin Truex, Jr. won the Quaker State 400 at Kentucky Speedway in dominant fashion Saturday night, winning all three stages and leading 174 laps en route to his fourth victory of the 2018 campaign. By the numbers, the defending Monster Energy NASCAR Cup Series champion is having a better 2018 season than he had a year ago. And yet, the Mayetta, NJ native is only third-best on the win list, behind five-time winners Kyle Busch and Kevin Harvick. Between them, Busch, Harvick and Truex have rode roughshod over the competition this season, gathering up 14 checkered flags in 19 starts. That’s a degree of dominance unprecedented since the heyday of Petty, Pearson and Yarborough in the 1970s, when less than a half-dozen teams won with any real regularity. Lately, it has gotten to the point where organizations like Team Penske, Hendrick Motorsports and Richard Childress Racing -- championship-caliber teams in any other campaign -- are resorting to desperate measures just to keep pace with NASCAR’s new, holy triumvirate. Penske’s Brad Keselowski and Stewart Haas Racing driver Kurt Busch were the only drivers to cramp Truex’s style Saturday night, and they did so only by implementing contrarian race strategies; taking two-tires and remaining on-track for as long as possible in hope of catching a fluke caution flag and trapping Truex a lap down. Truex: Four wins and counting. Hope, they say, is a lousy business plan. But for anyone not named Busch, Harvick or Truex, hope is about all that’s left these days. It’s virtually impossible to imagine any of NASCAR’s “Big Three” failing to advance to the championship finale at Homestead. For as dominant as they have been in the win column, Busch, Harvick and Truex hold comfortable margins in playoff points, as well. Behind Busch (30), Harvick (27) and Truex (25), the next-best driver in the playoff points category is Clint Bowyer, with 10. No other driver has more than seven playoff points, meaning that the “Big Three” can have one bad race in every three-race playoff round, and still advance. Busch, Harvick and Truex have been particularly dominant on the sport’s bread-and-butter, 1.5-mile ovals this season, winning every single start at those intermediate venues. With fully half of the MENCS playoffs contested on 1.5-mile tracks -- including the season finale at Homestead Miami Speedway on Nov. 19 – it’s tough to imagine anyone else crashing their championship party. Granted, there’s still a long way to go. Seven weeks remain before the start of the MENCS playoffs; ample time for someone to catch fire and insert themselves into the championship discussion. Bowyer, Logano, Erik Jones have all visited Victory Lane at least once this season, and while Austin Dillon has plummeted in the standings since his season-opening Daytona 500 win, his ticket is punched for the playoffs. There are at least a dozen others – Keselowski, Kurt Busch, Kyle Larson, Denny Hamlin and Ryan Blaney at the head of the list – who could crack Victory Lane before the playoffs begin. And with the memory of the 2011 season still fresh in our minds – when a winless Tony Stewart staggered haplessly into the playoffs, then reeled off five wins in the final 10 races en route to the championship – hope springs eternal. But someone needs to start showing signs of life, almost immediately, if they hope to unseat Busch, Harvick and Truex from the championship table.